You may distribute a set of default files and folders to all users by placing them in directory that is readable by the webserver user. This allows you to overwrite the files that are shipped by default with Nextcloud in core/skeleton. That custom directory should then be configured in the config.php via the configuration option skeletondirectory (see Configuration Parameters). Leave empty to not copy any skeleton files. These files will be copied only to new users after their initial login, and existing users will not see files that are added to this directory after their first login. The files in the skeleton directory are copied into the users data directories, so they may change and delete the files without affecting the originals. 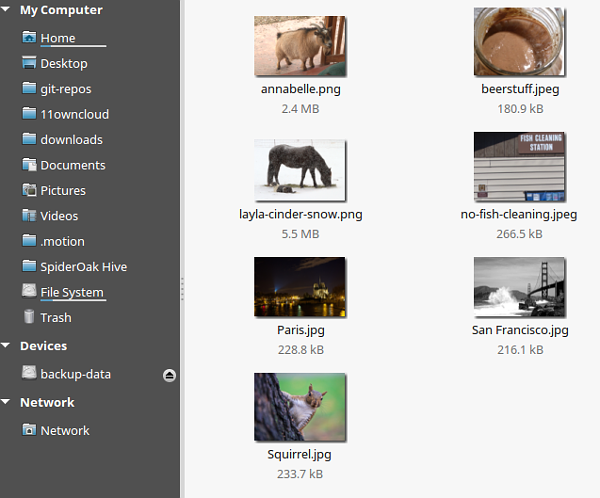 This screenshot shows a set of photos in the skeleton directory. They appear on the user’s Nextcloud Files page just like any other files. Overwriting the files in core/skeleton is not recommended, because those changes will be overwritten on the next update of the Nextcloud server.